2010 marks the 27th year for this jewel of Pennsylvania festivals. Located in rural Berks County in the small community of Lyons, this event attracts 4 to 5 thousand people annually. The event features a large craft area, continuous entertainment, home cooking with the famous iron kettle soups. 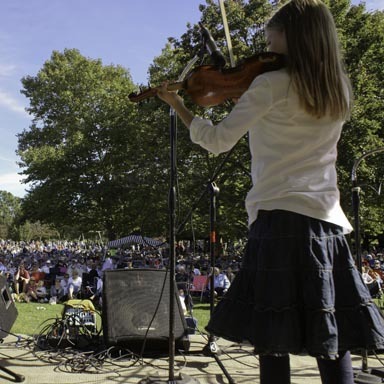 The event showcases the 27th annual fiddle festival. Fiddlers compete for trophies and cash prizes. In the 27 years over 350 fiddlers have competed in the contest, many going on to have great music careers. Truly a step back in time when things were much more simple! The 2010 festival is scheduled for Sunday, September 19th (rain date 9/26) from 9am to 5pm. In the Lyons Community Park, Lyons, Berks County Pennsylvania. Thank you so much for reminding us of your annual Lyons Fiddle Festival for 2010. I can't imagine a more enjoyable day than enjoying an early Fall PA festival and listening to the fiddle contest. The kettle soup sounds awfully good too!